Conference of European Rabbis issues strong statement against liberal Orthodox group, says its rabbis 'will not be recognized' in Europe. The Conference of European Rabbis (CER) issued an unusually harsh statement this week condemning the United States-based liberal Open Orthodoxy movement, and warning that Orthodox communities in Europe would not employ rabbis ordained by the group until it returned to normative Orthodox practices. In the declaration, the CER - which represents some 700 European Orthodox rabbis - emphasized that it embraces only those rabbis who "were ordained in accordance with halakhah (Jewish law - ed. ), and who lead their communities according to the generational traditions as handed over at Mount Sinai, and passed on by the poskei hador (major halakhic authorities - ed. )," and who hold fast to fundamental, traditional Jewish values. CER would not accept "any initiative that is not in the spirit of the halakhah" or ancient Jewish tradition, it added - referring to the Open Orthodoxy movement. "The Conference views with great pain the deviations from religious foundations emanating from the movement called 'Open Orthodoxy', and warns that those who act in this spirit, alumni of the aforementioned movement... will not be recognized by us as rabbis, with all that entails." Rabbi Jonathan Guttentag of Manchester, UK, explained that by systematically testing the boundaries of normative Jewish practice, Open Orthodoxy "has pushed the envelope that bit far, and... led to positions which take its proponents outside the Orthodox umbrella." While acknowledging that the group did tend to keep just within the confines of Jewish law, he and other rabbis emphasized that for Orthodox Jews the "spirit of the law" was almost as important. "At the end of the day, Orthodox life... is dependent on certain parameters, and crossing over the line of those parameters puts its adherents and proponents outside the frame of Orthodoxy. Ukrainian Rabbi Refael Kruskal said the strong message was intended not to alienate Open Orthodoxy, but rather to encourage its leaders "back into the fold," while protecting the traditions of religious Jews in Europe. 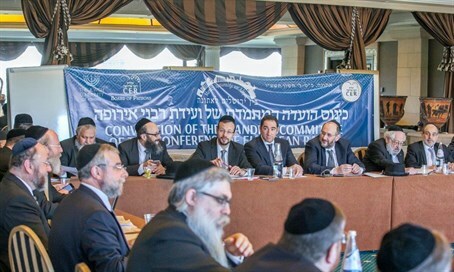 "The CER realizes that there are people in Europe from these organizations (who) are applying for rabbinical positions... and they're worried about the consequences," he said. "We hope that Open Orthodoxy will... come back within the fold, that they'll understand that they've gone too far, they've crossed the lines. and if they don't then the drastic steps we spoke about will be taken."